2017, what a year! The born year for Outline Tourism! And this is a fact, enough to make 2017 a truly unique year! Truth is that Outline Tourism has been planned for the last three years, but as a pioneer start up for greek standards, it took plenty of time to be developed as we visualised the final project. No doubt at all, the start up for Outline Tourism was the most significant thing that happened last year for us. But that was not the only. Some other facts along, composed a very interesting and creative year. These are the following, listed in time order since is impossible for us to choose in order of importance. The creation of our corporate video, which was used also by the Region of Central Macedonia for their marketing. It was a real satisfaction for us that our video received such positive reviews and comments. It should be noted that the provision of this audiovisual material to the Region of Central Macedonia, was without any financial benefit for Outline Tourism. Taking over by our team, the construction and maintenance of the best downhill trail – as been voted by the participants in the Greek Downhill Cup – at the Vasilitsa Ski Resort. Our participation at Eurobike in August, at the biggest exhibition in the world, related to cycling trips where we exhibited for the first time mountain bike holidays in Greece. Interest and response were highly encouraging both for Outline Tourism and for Greece in general. Our first groups, consisting by European customers on the trails of Thessaloniki and Olympus, which filled enthusiasm our European friends and demonstrated once again the excellent potentials of mountain bike tourism in Greece. The presentation of Outline “Development of Mountain Bike Destinations” which took place at the Conference on Alternative Tourism during the 33rd Philoxenia Exhibition in Thessaloniki. This presentation was made in partnership with Allegra Tourismus, a leader Swiss company in the sector of Mountain Bike tourism, with many, major projects around the world in countries such as Austria, Switzerland, Italy, Norway, Japan, USA and others . Organising and hosting a team from Germany in order to cover a mountain bike photo-story in Greece and specifically the area of ​​Thessaloniki and Mt. Olympus. The team we hosted included pro riders, action photographers, as well as the founder of EVOC, world’s largest mountain bike and free-ride skiing bag company. This photo-story was published at Bike Magazin at the March 2018 issue. Last but not least, our new offices in the most beautiful and historic area in centre of Thessaloniki. 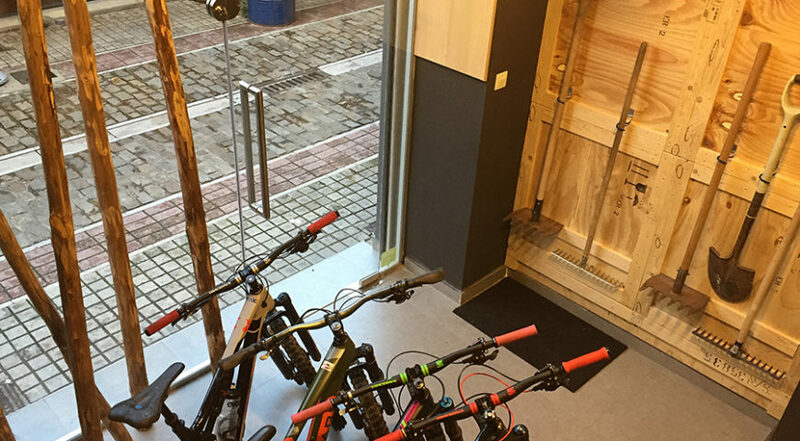 Our vision for our office is to be an open space for those who love mountain biking and all outdoor activities in general. Our ambition is to be a workshop for those who want to be actively involved in outdoor activities, much beyond the boundaries of a simple tourist agency. We wish for 2018 that we will have equally innovative and interesting projects. And Outline Tourism to continually provide high quality services to a tourism sector, that is now starting to develop in Greece. We will try to do our best in this direction.